Itsukushima is an island in the western part of the Inland Sea of Japan, located in the northwest of Hiroshima Bay. 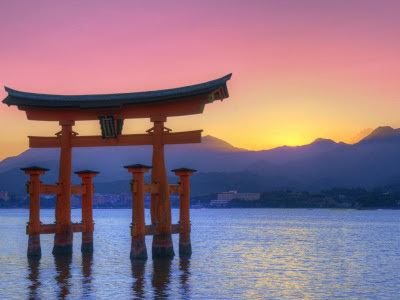 It is popularly known as Miyajima the Shrine Island, best known for its famous "floating" O-torii gate. The shrine complex is listed as a UNESCO World Heritage Site and the Japanese government has designated several buildings and possessions as National Treasures. The area designated for World Heritage comprises of the 431 hectares including the Itsukushima Shrine, and the adjacent sea, and the Mt Misen Primeval Forest (National Treasure) to the rear. The O-torii Gate is about 16 meters in height and weighs about 60 tons. The main pillars are 9.9 meters in circumference, and made of natural camphor trees, while the four supporting pillars are made of natural cedar. The present O-torii was erected in 1875, and the eighth since the Heian Period (the last division of classical Japanese history, running from 794 to 1185). According to records, the shrine was established in the time of Empress Suiko. The warrior-courtier Taira no Kiyomori gave the shrine its present form. In 1555, Mōri Motonari defeated Sue Harukata at the Battle of Miyajima. Toyotomi Hideyoshi built a large building, the Senjō-kaku, on a hill above the shrine. The island of Itsukushima, including the waters around it (part of Seto Inland Sea), are within Setonaikai National Park. This sea is affected by strong tides. At low tide, the bottom of the sea is exposed past the island's O-torii. At high tide, the sea covers all the previously exposed mud and fills areas underneath the shrine. The Itsukushima Shrine at high tide, when it appears to float on the water. The shrine was designed and built on pier-like structures over the bay so that it would appear to be floating on the water, separate from the sacred island, which could be approached by the devout. Mt. Misen is the highest peak on Miyajima island, 535 meters above sea level. Since the year 806 it has attracted devout worshipers. The natural environment has been kept intact which creates magnificent scenery. The Miyajima Ropeway is a network of gondolas that traverse the island, which is rare and unique in Japan and is often described as walking in the sky. Kiezu-no-Reikado Hall is located about 20 minutes on foot from Shishiiwa Ropeway Station. The holy fire that Kobo Daishi lit for his ascetic training has been kept burning for over 1,200 years in Reikado Hall. The hall has been designated a "Lover:s Sanctuary" as the flame is akin to the eternal fire of love.